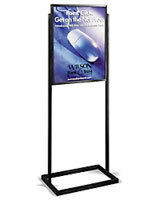 This chrome poster stand is an affordable advertising tool and one of our top-selling products. 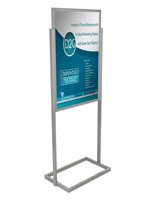 Place out in front of store entrances or along mallways to let shoppers know about new product lines or promotional sales. 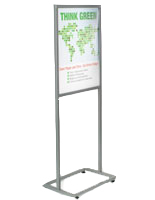 The chrome poster stand accepts 22" x 28" graphics and the display is double-sided. 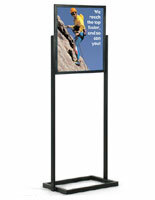 Your graphics insert through the slot at the top and rest behind clear non-glare protective lenses. 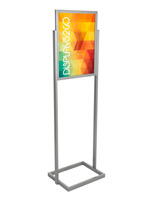 Our poster stand with shiny chrome finish is a great choice for upscale clothing stores!